As you probably know, Dr. Seuss’s birthday is coming up this week – on March 2nd to be exact. We are really big fans of his work in our house and read his books almost every night around here. We have every book he’s ever written, so we definitely have a lot of his books to keep us busy. 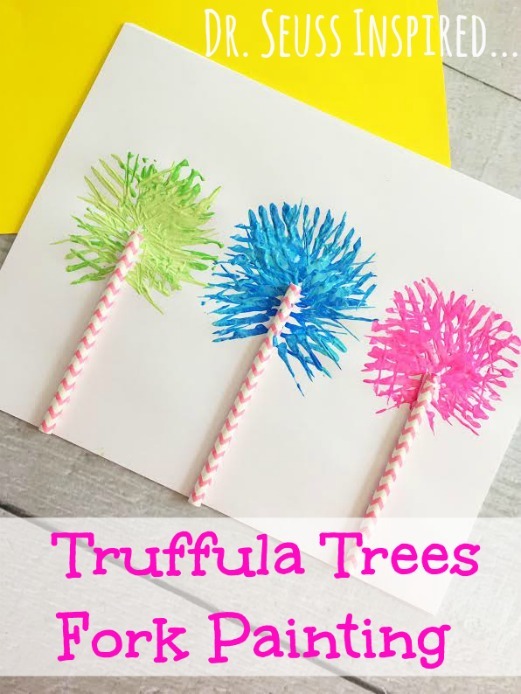 Today I wanted to share a fun craft that I made recently that was inspired by Dr. Seuss and one of our favorite books of his: A Truffula Trees Fork Painting from The Lorax. We seriously love The Lorax and since it is one of our all time favorites, I couldn’t resist a fun craft inspired from that book in particular. These Truffula Trees are really easy to make and I think it’s a fitting tribute to the works of such a brilliant man. 1. Turn your white paper lengthwise. 2. Cut 1-2″ inches off of each of your straws so they are different lengths and carefully hot glue them vertically them to your lengthwise paper. 3. Mix 2 shades of blue paint lightly together, 2 shades of pink paint, and 2 shades of green paint on a paper plate. 4. 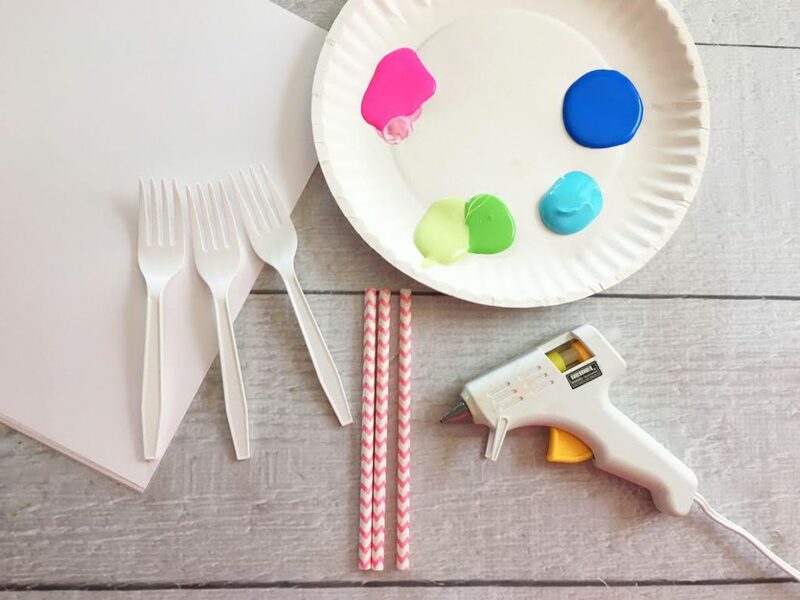 Dip a different fork into each color paint and press the fork onto your white paper around the top of each paper straw. Each straw will end up being a different color Truffula tree. 5. Let your Truffula trees dry and display. I am really happy with how my Truffula Trees Fork Painting Craft came out and have it hanging on my fridge as as speak. Are you doing anything to celebrate Dr. Seuss’s birthday this year? What is your favorite Dr. Seuss book? How creative! I love the idea of using forks to make such an adorable kids art activity! My kids would absolutely enjoy this! This is so cute! I love the Lorax and my kids used to be really into Dr. Seuss. Love this idea. My kids just made these in class. They had a blast and it was so easy. Those are so cute! I love crafts like this that are super colorful and easy to do. This is super creative I love the use of the straws to create the 3D picture! I can imagine how fun this is for kids. Oh, that is so cute! I would have loved to have done this with my youngest about 2 years ago. I love it! How fun! My daughter would love to do this. I’ll have to ask if she wants to make these. What cute trees. This looks like a fun craft. I will share this craft with my friend who owns a preschool. The little ones would be so happy! This is such a cute idea. I love a good Dr. Seuss craft. Me too. Dr. Seuss has always been a family favorite in our house. This would have been a great tie in when reading. These are so simple! And look just like the trees in the movie. Wouldn’t this be cute in a baby room?? I think it is adorable. Love those paintings! love Dr. Suess! I love how it turned out. The kids always have a lot of fun with paint and this will definitely be something that they would enjoy. Thanks for the craft idea! This is so cute. My son loves painting, i will definitely share this idea with him. Thanks for sharing. What a fun little project! My kids always loved the story of The Lorax. I think they would have enjoyed having some truffula tree decorations. Wow, I’m impressed with how nicely something so simple turns out. We are big Dr Seuss fans here. My kids were given a big set of his books when they were little. Classics we’ve saved for the next generation. Holy Moly this is cute! What a fun idea! I’m going to do this next year with my son! oh! we have so many dr suess books! dunno which one is my favourite! but i would like to make some crafts for my daughters props tomorrow, it their school book day. thanks for the tutorial! What a fun and cute craft to help ring in spring. Those Truffula Trees were always one of my favorite things about Dr. Seuss! What a cute fun way to make these trees. My boys and I love Dr Suess books. This would be so much fun to do with a preschool group. I would love to read the book and then do the activity . This is such a fun idea! My little man loves pain and bright colors, I think he would enjoy this craft so much! We have been reading through Dr. Seuss recently too! What a cute craft! I remember doing this in grade school. We had so much fun then. My favorite Dr. Seuss book is Green Eggs and Ham. It is also my kids’ favorite. That was so cool and fun to do for the kids. I have already greeted Dr. Seuss earlier, but here is my greeting again. Advance Happy Birthday to the famous kid’s doctor. That’s really fun to do! I like that you can simply do this with the materials that you have at home. It’s definitely awesome. What a great project! My girls always loved this story and it definitely would be a great activity to do with them and their friends! What a fun project! My favorite Dr.Suess is, A Cat In A Hat. What a creative idea for a craft! I’d have never thought of using a fork to paint with. Dr. Seuss books are an icon. I think this is a really easy and fun craft that even our youngest grandchildren can make. Looks like a craft afternoon will be happening. I always love the creations you come up with. You make them so simple that even I can do them LOL. This one is no exception I love it. I love all the colors you have to. SO incredibly cute! I would never have guessed this was done with a plastic fork if I didn’t see that here. I love this idea and will do this over spring break with my one daughter. I think she will enjoy making Dr Seuss inspired truffula trees. As for my favourite Dr Seuss probably Cat in the Hat. There are so many great ones though. I love The Places You Will Go too. Sounds like a great activity for kids! I am sure they’ll love these! This is such a fun idea. My kids are going to love making these. I will have to get out the paints this weekend. I’m really impressed! It’s not a lot of supplies or mess, and it seems to produce awesome art. Celebrate Dr. Seuss – yay! These are cute! I would never have thought to use a plastic fork to give a craft a different look. This is so cute! What a great craft for kids! That’s a really cute idea for kids to do . I am sure my niece would love to try this. This is a really cute craft idea! My kids’ school just had movie night on Friday and showed “The Lorax”! Dr. Seuss was and is one of my all time favorites and anything that keeps that memory alive is great by me. Love the Truffula trees. These are so cute and I love that it’s an easy craft for the kids. I have everything we need to make these. The Lorax is one of my daughter’s favorite movies. I will have to try this craft with her this weekend! My daughter just did a school report on Dr Suess and I know she would have so much fun with this easy craft. So colorful and eye catching! That’s very clever! I’ll have to show my youngest this, I’m sure he’d enjoy it! How baaa-aaa-aaa-aad can I be? I’m just doing what comes naturally. 🙂 Love that movie, and the craft is awesome. This is such a fun kid’s craft. My kids love Dr. Seuss books. They know these trees well and wouuld love to do this craft. I am doing this with them this weekend. This is a really cute craft! It would be very simple to pull off and fun for the kids to do. These are so cute and look easy it makes me wish I still taught second grade! What a fun classroom project. I would have never thought to this with forks!! I will have to do this with my kids this week. This is a genius idea and the finished product looks exactly like the truffula trees. We are huge Dr. Seuss fans! Those are cute I want to see the orax movie. I’ve never seen it yet. I love the trees. They’re so happy. That’s so creative and pretty! I can see kids having lots of fun doing this. How fun! My youngest is a huge crafter and I’m always looking for something new. I can’t wait to share painting with forks to make this with her. What a cute idea! We actually did not even take the time to read a Dr Seuss book yet this week. Adorable kids craft! My daughters would love to do this together. That’s a cool little craft! I don’t celebrate Dr. Seuss’s birthday, but I know a few people who do. I might need to share this with them. Now this is sooooo cute! What a great idea to share with the kids…thanks! Wow that’s so neat! And it’s very simple. I like that. That is such a great idea!! I’m sure the kids would love making this!! This is totally cute! I really love it my kids will love it as well. Very creative to use the plastic forks. It makes an interesting shape. What a fun artwork! I forgot Dr. Seuss Birthday this year.. oh how could I? Those are adorable! My kids’ school is doing a whole Seuss week. I’ll tell their teachers about this! OMG these are adorable! I want to make a big one and hang it in my living room LOL. So creative!!! What a cool idea this is 🙂 Love your creativity! Oh this is such a fun and easy activity for the kids. I am sure anyone would enjoy this one. When I was a kid they didn’t celebrate a Dr. Seuss Day at school like they do now. I really like that they do. My kids always have fun with it. It’s so whimsical. I have a friend that has twins – she always did the Thing 1 and Thing 2 on their shirts. We love Dr Seuss and The Lorax is one of our favorite movies! This is such a great craft, never though you could paint with a fork.